Hands down the best value rigs available today. Rigs have become synonymous in new boxes and performance centres. The layout of the rigs allows coaches to monitor multiple athletes at once. The Wall Mount Rig is available in four standard sizes (10’, 14’, 20’, 24’) but is also expandable in 4’ and 6’ sections should you require more than 24′. All Wall Mounts include J-cups for each 4′ Station with 2” hole spacing. Our Rigs are made from heavy duty 2.5” X 3.25” powder coated steel. We use 3/4” Bolts and Fasteners across all the Series. This combination of material and hardware make our Rigs the most stable Rig on the market. 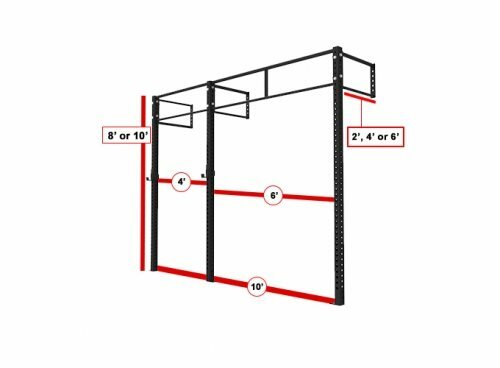 Customize the height, length, width and accessories to make this rig the perfect fit for your gym. Our rigs come with the added bonus of including all concrete anchor bolts required to install your rig.